At a time when welfare regimes in Anglophone countries are being reshaped to reflect neoliberal ideology, there is little by way of empirical, qualitative research which directly addresses the question of how jobless families live or are affected by their circumstances, particularly in regional Australia. This study combines a consideration of questions of social structure as they pertain to jobless families at the theoretical level with an ethnographic journey into their life worlds. It aims to understand the impact of long-term joblessness upon the families and to explore the interconnections between system and life world. I adopt Layder’s (1997, 1998) theoretical and methodological formulations as the most appropriate means to underpin an investigation of this nature. The study is comprehensively situated within a structural context which examines discourses and events that have exerted an influence on our present social arrangements, including an analysis of relevant social policy. Semi-structured, in-depth interviews were conducted with two non-purposive samples and analysed using a modified Grounded Theory approach as advocated by Layder (1998). It was found that the current welfare regime helps to stabilise the capitalist global economy and does at least provide a precarious stability for those excluded from the labour market. Whilst families receiving long-term income support are not a homogeneous group, they are subject to hidden injuries in common. The linkages between system and life world are theorised in terms of the displacement principle, which holds that the displacement of a problem does not solve it, but merely relocates it elsewhere. It is used to explain both large-scale displacements as well as micro processes occurring within jobless families. Long-term joblessness is found often to have destructive consequences for intimacy, though family structure may remain intact. This is partly due to a welfare regime which disrespects its beneficiaries. I argue that social policy must be informed by an alternative discourse which includes social or welfare rights as a part of human rights, based upon recognition of mutual interdependency and an ethic of care. This is vital if future policy directions are to accord equal respect to all citizens. 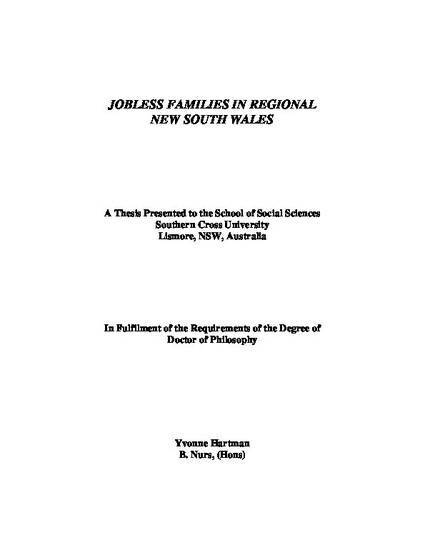 Hartman, YA 2006, 'Jobless families in regional New South Wales', PhD thesis, Southern Cross University, Lismore, NSW.